We were called out to this home in La Jolla, CA to inspect the existing saltwater chlorine system. The customer was noticing that his pools chlorine levels were not keeping up and the pool was starting to get algae. Once we looked at the age of the saltwater cell and the type of saltwater system that was installed we knew it was needing to be replaced. This AutoPilot saltwater chlorine system is not one of the best saltwater chlorine systems made. The product is inferior and their customer service is lacking. We discussed this with the La Jolla swimming pool owner and he was happy to replace the entire unit. 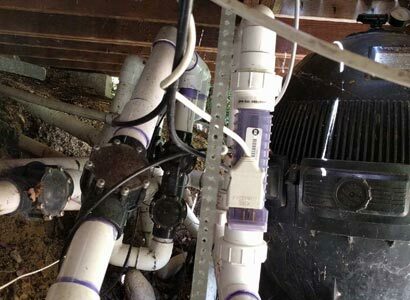 Based on this specific application, we recommended the Pentair IntelliChlor IC40 saltwater chlorine generator. The IC40 unit will produce plenty of chlorine for this La Jolla swimming pool and will allow the pool service technician to keep better care of the chlorine levels in this swimming pool. 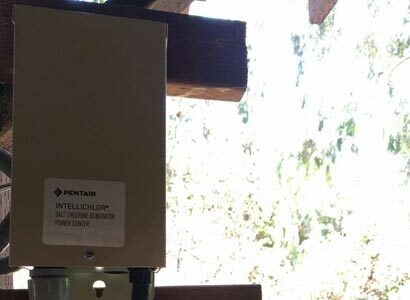 The new Pentair IntelliChlor IC40 saltwater system allows for easier control of the chlorine production by having the controls right on the face of the salt cell. This will allow the pool service technician the ability to check on it each week during his visits and will allow him to make changes quickly. This system is also very easy to perform salt cell cleanings that are typically performed every three to four months. This is based on how the water chemistry is maintained and if the service company is adding a mineral and metal sequestering agent to the pool water periodically. 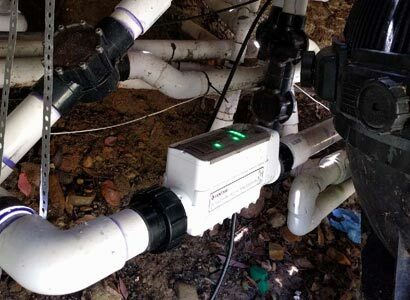 When maintained correctly, this Pentair IntelliChlor IC40 saltwater pool system should last many years. The salt cell itself should last at least three years as long as it is maintained. Whenever you are using a saltwater chlorine system, you should always include a mineral and metal sequestering agent as it will prevent calcium buildup to be minimized in the cell land prevent possible scaling of the pool’s surface. This swimming pool in La Jolla is the main focal point in the backyard and the homeowner wants to make sure his swimming pool is in perfect condition. 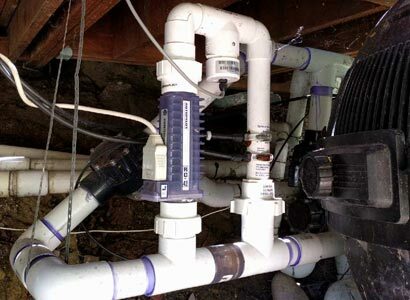 If you live in La Jolla, Ca and have a saltwater chlorine system that is not working correctly or you need a new saltwater chlorine system, we can help. We install all makes and models of these systems but, we highly recommend specific versions based on your specific requirements. We perform pool equipment repairs on all types of pool equipment including new pool equipment upgrades in La Jolla and all other areas of San Diego County. If you have questions or need help with your swimming pool, we can help. Give us a call or feel free to fill out our contact form to get in touch as we are always happy to answer questions or schedule any necessary pool equipment repairs or new equipment installations.